Joan Miró i Ferrà is a world renowned Spanish Catalan painter, sculptor, and ceramist working through out the early to mid 1900’s, and had a significant impact on defining the role of art during and after WWI. Miró maintained an independent approach to making art and never formally joined an art group, though it was acclaim for his Surrealist paintings that brought him international fame. His style is singular and cultivated from his expressed contempt for conventional painting methods as a way of supporting bourgeois society. He spent his career at war with convention and famously declared an “assassination of painting” in favor of upsetting tradition. Miró experimented with many art techniques, the the final work always expressed his unique style that embodied his Catalan heritage and anti-art ideology with child-like whimsy. Miró was born in Barcelona the son of a watchmaking father and a goldsmith mother on April 20,1893. No doubt his parents’ occupations privileged him with early exposure to art. Drawings by Miró have been recovered dating to 1901, when he was only 8 years old. Miro enrolled at the School of Industrial and Fine Arts in Barcelona until 1910; during his attendance he was taught by Modest Urgell and Josep Pascó. After overcoming a severe case of typhoid fever in 1911, Miró devoted his life entirely to painting at the La Lonja School of Fine Arts in Barcelona, taught by Francesc Galí. In 1918 set up his first individual exhibition in the Dalmau Galleries, still in Barcelona. His works at this time reflect the influence of many different art movements, such as the pure and brilliant colors used in Fauvism, shapes taken from cubism, influences from folkloric Catalan art and Roman frescos from the churches. From the start Miró had a very precise style, picking out every element in isolation and detail and arranging them in deliberate composition. But in 1920 he took a trip to Paris and the art he witnessed there inspired a radically altered style. Miró befriended Andre Masson and participated in developing Surrealist movement. In Paris, under the influence of Surrealist poets and writers, he developed his unique style: organic forms and flattened picture planes drawn with a sharp line. Miró’s style has been interpreted as Surrealism combined with the playfulness and whimsical nature of a child born from his use of automatic drawing – a way express the subconscious by allowing the hand to move randomly across the paper. Miró was interested in automatism for its anti-art technique and in the use of sexual symbols (for example, ovoids with wavy lines emanating from them), and he and André Masson were among the first artists to develop automatic drawing as a way to undo previous established techniques in painting. But Miró still purused his own interests and ideals; as displayed by his additional involvement with Expressionist and Color Field movements. Because of his work with Masson and love for automatism, Miró is associated with the founding of Surrealism as an art movement and is often considered a Surrealist. Historians further theorize that Miró’s surrealist origins evolved out of “repression” because during World War I Miró was forced into exhile to escape the Franco regime pursecution of Catalans. Miró, however, refused to subscribe to any art movement, despite apparent evidence that his style was influenced in varying degrees by Surrealism, Dada, and the war. This refusal demonstrates Miró’s pursuit of complete freedom to experiment with any artistic style he wanted. He pursued his own interests in the art world, ranging from automatic drawing and surrealism, to expressionism, Lyrical Abstraction, and Color Field painting. In 1921, he showed his first individual exhibition in Paris, at La Licorne Gallery. The culmination of his early style was The Farm (1921–22). The rural Catalan scene it depicts is augmented by an avant-garde French newspaper in the center, showing Miró sees this work transformed by the Modernist theories he had been exposed to in Paris. The concentration on each element as equally important was a key step towards generating a pictorial sign for each element. The background is rendered in flat or patterned in simple areas, highlighting the separation of figure and ground, which would become important in his mature style. He concentrated his interest on the symbol, not giving too much importance to the representing theme, but to the way the symbol emerged as the piece of his work. In 1928, he exhibited with a group of surrealists in the Pierre Gallery, also in Paris, but as always Miró maintained his independent qualities when adopting ideologies of different art groups. Miró made many attempts to promote his unique work, but his Surrealist colleagues found it too realistic and conventional, and so he soon turned to a more explicitly surrealist approach. From 1929-1930, Miró began to take interest in reconstructing the object through collages. This practice lead to his making of surrealist sculptures. His tormented monsters appeared during this decade, which gave way to the consolidation of his plastic vocabulary. Miró dabbled in Cubism too; though he started after Picasso and Braque had established Cubism as a monumental art movement in Paris. Specifically, Miró responded to Cubism by declaring that he would “break the guitar” referring to Picasso’s paintings, with the intent to attack the popularity and appropriation of Picasso’s art by politics. He also experimented with many other artistic forms, such as engraving, lithography, water colors, pastels, and painting over copper. He created over 250 illustrated books known as “Livres d’ Artiste” (the book was displayed in “Joan Miró, Illustrated Books” at the Vero Beach Museum of Ar in 2006). It was at the end of the 60´s when his final period was marked and which lasted until his death on December 25,1983. During his final years, he concentrated more and more on monumental and public works. The murals are characterized by the same art language and freshness with which he carried out his canvasses, as well as the special attention he paid to material and anti-art informalism. In the final decades of his life Miró accelerated his work in different media, producing hundreds of ceramics, including the Wall of the Moon and Wall of the Sun at the UNESCO building in Paris. He also made temporary window paintings (on glass) for an exhibit. In the last years of his life Miró wrote his most radical and least known ideas, exploring the possibilities of gas sculpture and four-dimensional painting. 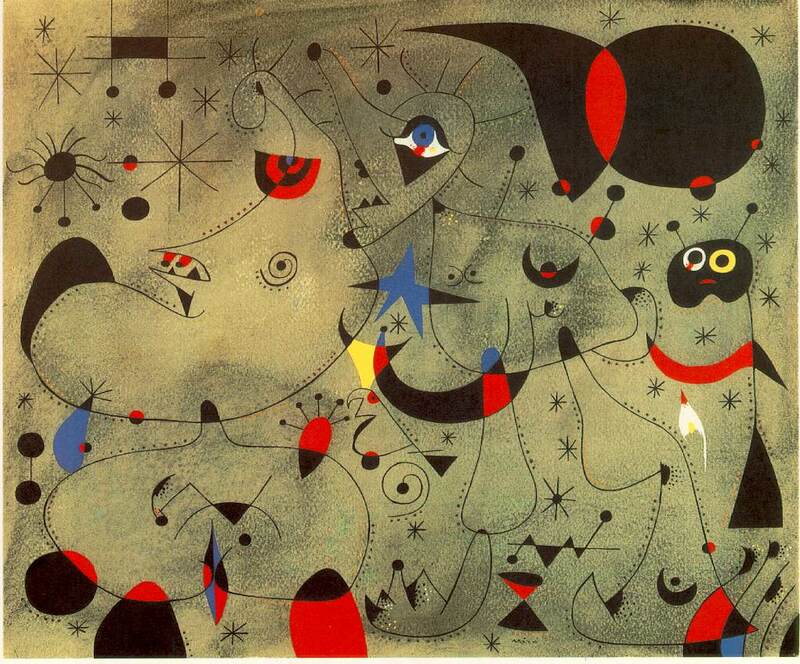 Four-dimensional painting was a theoretical type of painting in which Miró proposed that painting would transcend its two-dimensionality and even the three-dimensionality of sculpture. Truly Miró was a visionary with a singularly eccentric style that is the embodiment of his unique approach to his artwork. Aww thanks for reading dad. I am glad you related it to something. I am curious though, which one looks like ET?